You are here: Home » Ron Paul, the candidate. Long before he discovered Friedrich Hayek and other free-market economists, Ron Paul got a lesson in sound money from his oldest brother, Bill. Bill was 10. Ron was about 7. It’s not complicated, he insists. These are the themes he has been addressing, consistently, since he entered politics in 1974, over the course of 12 terms in Congress, through his third bid for the White House: Free markets are good. The Federal Reserve is evil. The gold standard should be restored. Government is the cause, not the cure, of the nation’s troubles. His first stint in the House of Representatives was only a matter of months. He did not retain his post in the general election later that year. On his next try in 1978, however, Paul was elected and even re-elected twice. Emerging as a strong critic of the country’s banking and financial systems, he began writing about his economic theories. In 1981, his book Gold, Peace and Prosperity: The Birth of a New Currency was published and was quickly followed by The Case for Gold: A Minority Report of the U.S. Gold Commission(1982). He expressed his pro-life and anti-federal government views in 1983’s Abortion and Liberty. After an unsuccessful run for the U.S. Senate against Phil Gramm in 1984, Paul was succeeded in the House of Representatives by Tom DeLay. Paul returned to his private practice, but did not stay out of politics for too long. A career Republican, Paul jumped ship in 1988 to become the presidential candidate for the Libertarian Party. In many ways, he was a good fit for the party with his interest in lowering taxes and reducing the size of the federal government. But Paul did differ with the Libertarians over the abortion issue as the party supports personal liberty and opposes laws and other restrictions on the actions or lifestyles of individuals. While he came in third, Paul received almost 500,000 votes in the general election. In the mid-1990s, Paul returned to the Republican Party and fought Greg Laughlin—a Democrat turned Republican—for his party’s nomination for a seat in the House of Representatives. The odds were against him as Laughlin had wide support from the party and from deep-pocketed organizations such as the National Rifle Association. Despite the opposing forces, Paul was able to defeat Laughlin and win the general election in 1996. He has remained a member of the House of Representatives ever since. 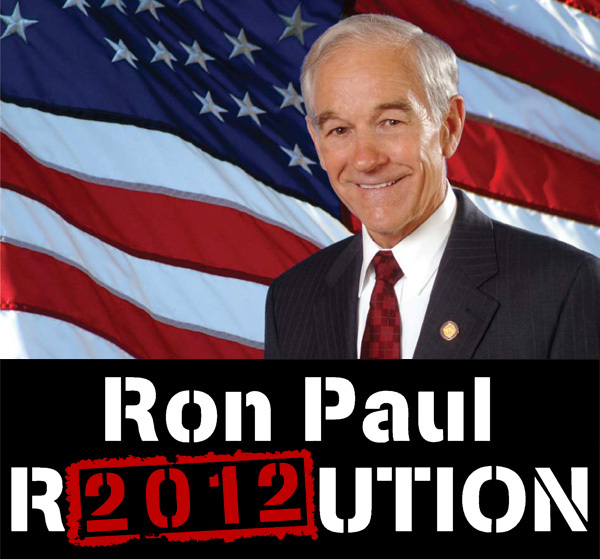 Whether it is as the Republican candidate or as a third-party spoiler, Ron Paul has a responsibility to stop the madness of Newt Romney. In a long career of political integrity, 2012 marks his last great chance to serve the nation. But it would be far better for both the Republican Party and the United States of America if Republicans would remove their blinders and embrace the only man with a coherent and potential effective solution for the challenges facing the nation as their candidate. 3 weeks till Iowa and not one mention. Ron Paul is the wild card in the Republican presidential deck—and that makes him one of the most important cards of all right now. ANKENY , Iowa — A surprising fact of the GOP primary: The oldest presidential contender is a magnet for some of the youngest voters. Farmageddon is a highly rated documentary currently available on DVD and will soon be seen by members of Congress thanks to Ron Paul of Texas, Chellie Pingree of Maine and Ed Perlmutter of Colorado on December 13th at 5:30PM on Capitol Hill. The documentary lays its focus on the unjust action of the government coming onto private property to impose its heavy hand on American citizens trying to live a healthy life and provide healthy, nutrient-rich food to Americans. ← Will Obama will sign NDAA 1031 Citizen Imprisonment Law in a few days?